Issue no.24 of Revista de Estudos Anglo-Portugueses/Journal of Anglo-Portuguese Studies returns, in several of the articles, to the study of Travel Writing, understood as a form of div(con)vergence between the Self and the Other, involving (de)construction of imagotypes, an hallmark of research in Anglo-Portuguese studies. It will be recalled that the first Masters’ dissertations carried out in this area dealt precisely with the accounts of British travellers to Portugal, particularly in the eighteenth and nineteenth centuries. The results of this research are now available on a database entitled “English Travellers to Portugal” (VIP) which can be consulted online at: www2.fcsh.unl.pt/ceap/pesquisaVIP.htm. Recently, work on Travel Writing has enjoyed something of a revival at the international level, stimulated by the publication of new theoretical works on the subject, many linked to Beller and Leerssen’s “Imagology (Revisited)”, and the writings of Zacharasiewicz. A series of articles published here, by Mariana Gonçalves – “Travelling through Portugal at the End of the Seventeenth Century: William Bromley’s Impressions of the Portuguese Kingdom” –, by Rogério Miguel Puga – “O Romance Epistolar enquanto Escrita de Viagens: o Imagótipo Luso e a Dimensão Anglo-Portuguesa em The Forest of Comalva, a Novel; Containing Sketches of Portugal, Spain and France (1809), de Mary Hill” –, by Maria Zulmira Castanheira – “The Victorian Traveller as Other: Stereotypes and Humour in the Periodical Press of Portuguese Romanticism” – and by Teresa Pereira – “The Enchantments of the Portuguese Countryside’: Escrita de Viagens e Propaganda Turística” – which may be considered,essentially, as part of this nouvelle vague, clearly demonstrate that research in this field is far from being played out and that plenty of scope remains, particularly as regards twentieth and twentieth-first-centuries accounts of British travellers/tourists in Portugal and those of their Portuguese counterparts in English-speaking countries. Researchers will soon be able to consult the E-Dicionário de Escrita de Viagens Portuguesa online at www.fcsh.unl.pt/…/e-dicionario-de-escrita-de-viagens-portuguesa-e-dictionary-of-portuguese-travel-writing-cetaps-1 which will undoubtedly include pertinent information concerning the accounts of Portuguese travellers in English-speaking countries. Teresa Pereira’s article, on the one hand, examines the association between travel writing and the tourist propaganda of the Estado Novo, whilst Zulmira Castanheira situates her analysis of travel writing within the framework of the periodical press, an apparently inexhaustible resource for new data on Anglo-Portuguese relations over different historical periods, and which, as a consequence, was chosen as the focus for several Masters and Doctoral dissertations in the area of Anglo-Portuguese Studies. 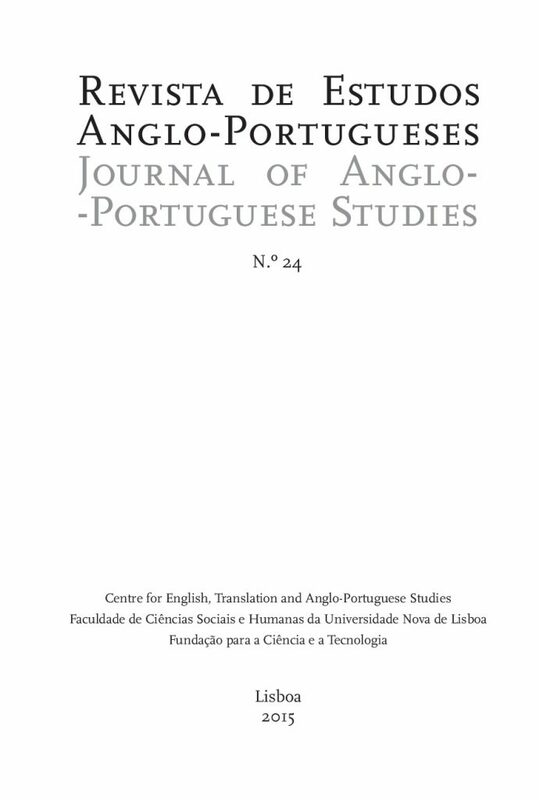 The articles by John Clarke and José Baptista de Sousa – “The Reception of the Braganças in England as Recorded in the British Press, 1827-1851” –,by Paulo de Oliveira Ramos – “Robert Bisset Scott e os seus ‘Roman Remains at Lisbon’” –and by António Lopes – “A Voz do Mineiro [The Miner’s Voice]: Raising the Working-Class Consciousness in a British-Owned Mine in Southern Portugal – a Discursive Approach” – deal with the analysis of the image of the Portuguese as portrayed by the British press in the nineteenth and twentieth centuries, confirming the importance of British periodical journalism as a privileged resource for any researcher who is interested in the analysis of journalistic discourse and consequently the (de)construction of images of the Self and the Other. The ongoing debate on the question of unity and diversity, a premise which significantly amplifies the perception of identity and is indissociable from any comparison between cultures, is an issue which is thoroughly discussed, albeit from different angles, in the articles by Miguel Alarcão, “ ‘Identity Matters’: Notas para uma (In)Definição de Identidade ‘Inglesa’ no Relato sobre a Conquista de Lisboa (1147)”, on the hybrid nature of Anglo-Norman identity against the background of the Siege of Lisbon; by Karen Bennett, “‘Like a Candle under a Bushel’: Rhetorical Identities in Portugal and England (16th – 21st centuries)”, focussing on discursive strategies associated to the construction of Protestant (English) and Catholic (Portuguese) identities; and Carlos Ceia’s review of Landeg White’s Letters from Portugal. Kondwani Publications, 2014”, an appeal to the quest for Portuguese identity. The comparative element, which is a constant feature of any work in the field of Anglo-Portuguese Studies, together with the analysis of the effects of British writing on Portuguese authors, or vice-versa, is adroitly exploited in Madalena Lobo Antunes’ article on the influence of James Joyce (and also Herman Melville) on Fernando Pessoa. Laura Martínez-García’s article, “A Defence of Whig Feminism in Centlivre’s Portuguese Plays The Wonder! A Woman Keeps a Secret (1714) and Mar-plot; or the Second Part of The Busy Body (1710)” clearly reveals the appropriation of characters and spaces (déplacement) in British literary works to convey social or political messages and, in particular, positive imagotypes of England, whilst maintaining Portuguese stereotypes, a transversal feature of texts analysed in Anglo-Portuguese Studies. As set down in the previous Editorial (no.23), REAP/JAPS will continue to publicise the work of all those who are working in the area of Anglo-Portuguese Studies, whilst, at the same time, identifying new areas of research (in progress or future), especially in the section entitled “Projects”. In this issue, Professor George Monteiro, in “Towards a Bibliography of Alberto de Lacerda (1928-2007)”, generously shares with our readers a plethora of bibliographical references, which will undoubtedly provoke a flurry of new work concerning this outstanding Anglo-Portuguese figure, which we hope to see occupying a privileged position in our next issue.